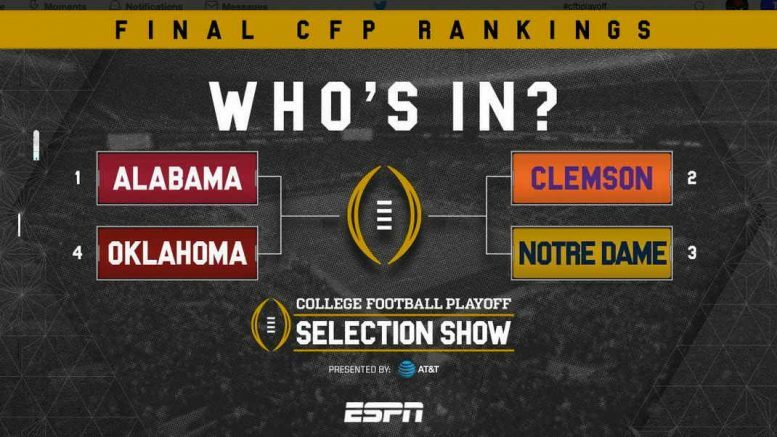 2018-2019 College Football Playoffs, who do you have in the finals, and who wins? I believe Bama will beat Oklahoma, and the total points scored in the game by both teams will exceed 100 points. Clemson v. Notre Dame is a wee bit harder. IF Notre Dame can get their Defense playing their best........and their Offense controling the tempo of the game by running the ball, they will win a close one. Bama ........... v ........... Clemson"
Bama wins.........IF TUA is playing, Jaylen can't beat Clemson imo. I'll go Clemson in the other game. I have Notre Dame on par with Ohio State as the 5th/6th best teams and I think it's unlikely they win this game. The last 3 championships have been decided by 5, 4 and 3 points. No matter which two make it, given these teams, I think it ends up a one-score game again. I'll stick with Oklahoma in the championship game. It would only surprise me if Notre Dame wins. I think the other 3 all have an opportunity. Only chance the Sooners have of winning is if they score 60 points or more. Bama will run up and down the field on them IF Tua is playing. If Jaylen is playing, then they might win with 45 points. Georgia's defense last year was better than Alabama's this year and Oklahoma put 48 on them, while Alabama only scored 26. Alabama may very well win, but they probably will have to run up and down the field to do it. Tua throwing 10/25 certainly won't cut it. We'll see. That's why the games are played. Meh - it's just not cricket. ........and crickets are a GREAT BAIT when fishing for Crappie! when Oklahoma put 48 on uga last year, they had this guy, what was his name??? oh yeah, baker Mayfield. they do not have him anymore. Not sure if you haven't watched this season, but Oklahoma's offense is better this year. Kyler Murray is set to break Mayfield's records as well as being the first FBS QB to average 300/60. He does things Mayfield couldn't. That was the point. They're more dangerous now. If Alabama wins, great; I'm not a fan of any of these teams, so I don't care who wins, but Oklahoma definitely has a chance. I should have made a thread but it's too late so I'll ask here, who do you guys think wins the Heisman? I think Tua. Alabama will defeat Notre Dame in the championship game. Alabama probably could beat most NFL teams on any given Sunday. Not most............this debate rages on various Sports Radio Talk Shows........and is usually laughed at by the "Experts." However, when the question was posed to the numerous Pros who played at Bama, they were ALL in agreement that IF Bama played an NFL Season (16 games), they would most likely win 4 or 5 games. Most NFL Teams are made up of the best of the best players in the Nation.........the 2%.......... and, while they may not look like when playing the best of the NFL Teams, they are, man for man, better than any College Team......man for man......... Bama has maybe 6 to 10 Pro caliber athletes every year........the rest will never play in the NFL. Say 8 or 10 million people watch the game........far more than that will be in Church Sunday morning just here in the US will they not? The world is a fallen creation, but it really isn't evil in and of itself...........there is a whole lot of evil living in this world, but they are the evil, not the earth.........shoot.......I thank God every night for the beauty of His creation, and pray to have many, many opportunities to be able to enjoy being out in His creation. congrats on wining signing day. Could lower our 5 Star rating down to 4.9 huh?